Born in 1953 I now live and play along the Central Coast of California with my wife, my best buddy. I'm a proud father of 5 kids and grandfather to 9 little ones. 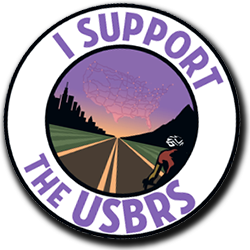 I created my blog in July of 2009 to share thoughts and information about recumbent cycling as others have shared with me. Also I take a occasional detour into family and useless musings. For most of my life I hiked until body parts started giving out. I always imagined that I’d be hiking until my time here on Earth expired. My time here on Earth is far from over. There is a lot that I still want to do and see, but I'm wearing out. I've lived a very physical life and now it's caught up with me. The medical profession has put my shoulder back together, twice removed torn cartilage from my knee, put the scalpel to my feet to put them back in good working order and repaired my lower and middle back. I also have new hips which left me with chronic muscle pain in my hips and the loss of part of my calf muscle because of nerve damage from the hip replacement. It has also left me with heterotopic ossification in my right hip. All topped off with a heart attack on Christmas day of 2011. In December of 2017 I turned 64 and even though my party parts may be wearing down I'm still going strong. After my heart attack in 2011 I weened myself off meat and turned to a vegetarian diet while at the same time taking whatever drugs the doctors told me to take. Within one mouth of starting statins after my heart attack I had a disastrous affair with these cholesterol lowering drugs. It convinced me that pharmaceuticals are to be looked at with caution and to not rely solely on a doctors bias advice. Soon I was off all drugs related to my heart attack. I control my colestoral and maintain a healthy heart and body through a common sense diet and plenty of green and white tea. I'm 6'1" and weight 185 lbs. I ride my trike 10 to 12 times a month. I exercise at least every 5 days using some weights and old fashion calisthenics. And I stretch everyday. I take turmeric to keep the blood flowing, vitamin D3 for heart health (old skin doesn't produce vitamin D like young skin) and Ibuprofen as needed. I also let big pharma make a little money off of me. I take an inhaler for mild asthma (growing up in a house full of cigarette and cigar smoke didn't help) and about every 3 months my doctor gives me a prescription for 20 low dose hydrocodone tabs for the days when I do too much heavy lifting or just do something stupid. 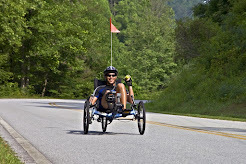 In early May of 2009 Dana at Bent Up Cycles showed me what recumbent tadpole trikes are all about. 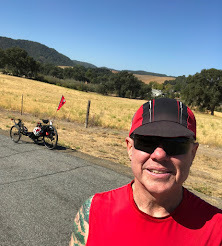 His knowledge of recumbent trikes put me at ease that I could transition from hiking to recumbent cycling. My first ride was a Catrike Expedition. It was soon followed by a Catrike 700 which was later upgraded to the new version of the Catrike 700 with 20' front wheels. I can still take short hikes but my trikes keep me alive both physically and mentally. Enough about me go RIDE! how did you fix the tubus rear rack to the catrike frame? Tubus has different size struts you can order that attach the front of the rack to the frame. The struts are attached to the frame with the Catrike rack adapter kit from the Hostel Shoppe. Thanks for taking a look at my blog. I have no regrets trying the Sprint but as you said "not great for me". As Spring approaches I'm going to spend some time exploring the Central Coast wine country. Would love to have company. Saw a comment of yours on the recumbent group of Facebook. Great blog! I'm 65 and just bought a Catrike Trail, knowing I was having surgery last week to remove discs c5-c7 and having them fused. All is well, and I'm eager to start triking. That said, I've spent much of the past 3 months researching trikes. You offer concise advise on such things as steering and shocks, vs weight and complexity, and I agree with your conclusions. Alan, Off and on I've considered the Schlumpf Mountain drive. But up to now I've stayed with traditional gearing systems for ease of maintenance. However if I were in a position where I had to do a lot of climbing with a load I believe I would give the super low gearing ability of the Mountain drive a try. Right. I've got to ride some hills to figure that out. I really try to learn from others, even with such simple things as to where to mount a bike pump, extra water bottle, snacks for a day trip etc. Once again, thanks for a great site!